Traci Bautista’s only book so far, Collage Unleashed, was published in 2006 but I just recently bought and read it. Maybe you already own or have read it, but for newbies like me I thought I’d share my thoughts on this little treasure trove of inspiration anyway. I’m crossing my fingers hoping Traci will be publishing more books, because I think this is a extremely fun book on mixed media (though it could be better with some adjustments)! I love Traci Bautista’s art style, with the girlie glam faces, flowery swirls and graffiti words among all that dripping color! Yummy! The projects included and the whimsical style of the pages is great fun, but I think many of the photos are too small, too dark and taken way too close which makes you miss the big picture! It is unfortunate that the layout and photography is not better, because layout is very important when you valuate an art book I think. Personally I’m a sucker for beautiful layout as you know, but this is not a book to swoon over with your eyes. Anyway, as I said; Traci Bautista has a wild and graffiti-like style that I absolutely adore! In her different chapters she is telling her readers about the different elements of her art and how she puts them together using everything and not least her sewing machine. First chapter is called Child’s Play: Painting Paper and Fabric which is where I had to stop reading at once to go paint backgrounds! 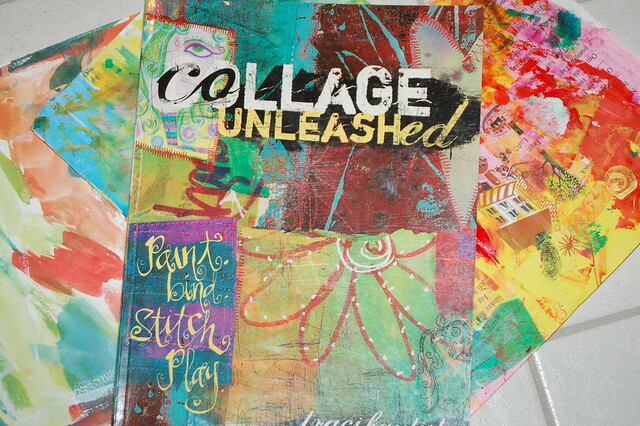 Here you’ll get some different techniques to make backgrounds and collage papers that you later can cut up and use in your “unleashed” collages. So much childish fun! In her collages she does not use any magazine images, drawings or even ephemera or photos. Traci makes her own papers (and painted fabrics) that she combines in a more naive, fun and non-figurative way. In Layers of Color: Printing, Stamping and Using Transparencies she shows you how to make printing plates, creating and altering imagery on transparent plastic (like OH-paper I think) and stitching to attach different layers on top of each other. Suddenly it felt like I kind of liked my own hand-writing as I was experimenting with it! I have never liked my handwriting before! Since then I’ve felt I like it more and more. I now have been writing in a style that is swirly and aggressive – but extremely fun and freeing to do. A carefree handwriting style developed for art making (when reading back is not very necessary)! 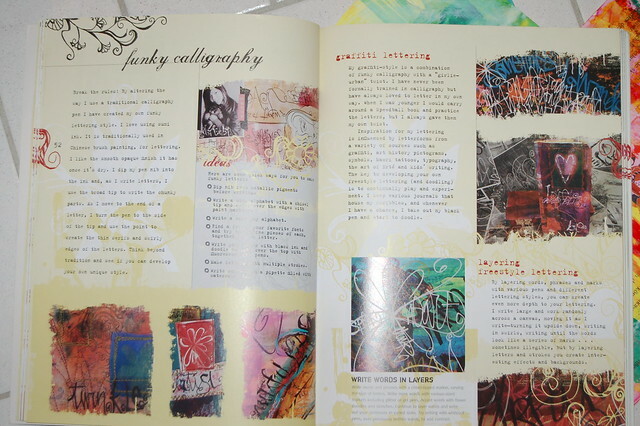 All Traci’s own graffiti doodles that has really inspired me. The chapter Total fusion: Combining Collage Styles, is all about putting stuff together to create a whole. Using the fabrics, tape, a sewing machine, glue, hand-writing, textured papers and doodling you make your art and in the chapter Wildly Bound: Stitching, Binding and Funky embellishments she teaches us to make signatures for book binding and to embellish our journals with macramé binding, weaving with fibers and doing some rug hooking on the canvas for the books spine even! I truly want to “climb into” her Messy Patches Art Book and her Butterfly-Flower-Graffiti Journal that is featured in the combining techniques gallery at the end of the book! Retro Rags with Traci Bautista from Creative Catalyst on Vimeo. Isn’t her style funky and cool? I get so much inspiration from just watching this little clip, and at the company Creative Catalyst there are several more commercial clips to watch in several sections, like the videos on mixed media for example! I stayed there for quite a while and got inspired. While doing some research I found a podcast called Diva Craft Lounge which looks like it’s a lot about paper and scrapbooking, though most recent episode is featuring Traci herself! You might also want to click around at her personal site treicdesigns and in her blog kollaj. She doesn’t have a big album of art online but you can find some of her art here and some beautiful workshop examples here! * More book reviews – by me. 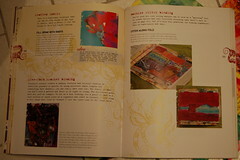 This entry was posted in Book Reviews and tagged collage exercises, the art journaling life. Bookmark the permalink. Waow, what a wonderful and fully documented post, as always. Thank you for being so inspiring every day. I have taken a couple of classes with Traci – her classes are fun and you end up making lots of art. I love how she leverages her art to make more art using copies and prints. My favorite thing is to dye the paper towels – did you try this? I have a stack of dyed paper towels and love the colors that result. I got this book a while ago but still haven’t actually got the paints out and played Traci-style. I shall, though. One day soon! That clip was so inspiring – thanks for putting it up. I love watching artists at work. I paged through this book at the store but didn’t buy it. Maybe the layout? I’ll have to go back and look again. I did laugh when I saw the crayon cookie idea-it’s an idea that’s been around for awhile as a way to recycle crayons/make your own large crayons for toddlers. I love them! Thanks for your comments and visit in my blog. More reviews to come I hope, I like writing! I hope you will like Traci’s book as much as i did! I got her book from amazon two days ago. I think I would get a lot more out of watching her video, but it’s a bit pricey. The book is ok, but I haven’t learned anything new yet. I’m a little more than half way through, and I’m still hoping it will be worth the money. 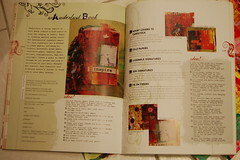 It’s a great book for newbies, but for those who have been doing mixed media for years, it’s same same same (so far).